I was part of a 12 month pilot program that my electric company sponsored. 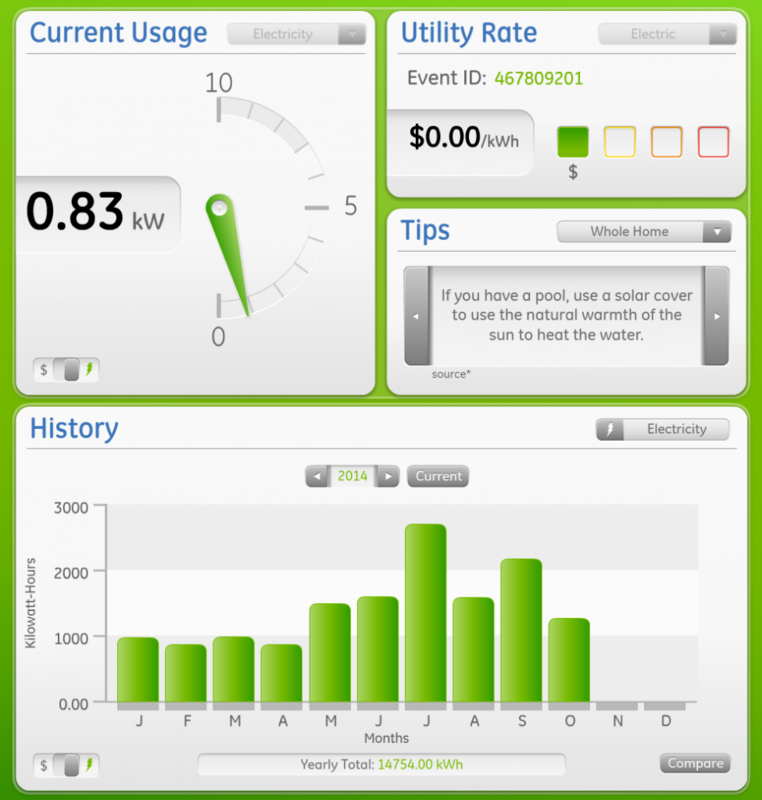 For no charge, they gave me a GE Nucleus system which basically provides me with a desktop application so I can see my real-time energy usage. It’s a pretty cool program. For some reason, the actual dollar amounts stopped showing up as soon as the pilot program ended, but the energy usage is still accurate because it is pulled from my smart meter. As part of this pilot program APS gave me a free home energy audit (paid for by my power company, APS). The home energy audit was really cool, but in my case, I think I’m already rather efficient. Here’s an email I sent to the company that did the home energy audit. I did a little bit of sleuthing on the APS site this morning. It looks like my actual energy usage cost is only about 41% of the APS annual cost estimate of $5,680. that you included in the APS document. Next, I looked at some of the solutions you suggested, and adjusted the estimated annual savings to reduce them to 41% of their previous totals. I believe the efficiency gains are probably accurate, at least I’m assuming they are. So, this feels like a fairly accurate way to figure things. Cooling system (new HVAC on west side): Since I already need this, not even worth calculating. Just need to determine when to do this. If it costs me $1,200 for the Aeroseal (that includes the $400 rebate), then it’s a 7.7 year ROI (it’s 10 years without the rebate). If this costs $245, then payoff sounds like it would be only 2.1 years (ROI). Your document said $376 per year in savings, so I’m figuring if I reduce it to 41% of that, then I’m figuring maybe $154.16 in annual energy savings due to a new pool pump. The trouble is, the new pool pump costs $1,695 (oh, only $1,545 when you include the rebate) and that means my actual payoff is around 10 years. Ouch! Sounds like it’s definitely a worthwhile investment if you already need one, but the current pool pump works just fine so tough one to swallow. Variable speed pool pump: I did some basic math on the pool pump to get an approximate idea of annual savings. It came to around $216/year in savings (see attached) if I were to get a variable speed pool pump. 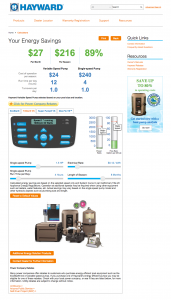 At $1,545 for installation of a new pool pump it averages out to around a 7.15 year ROI. Considering the existing pool pump will likely fail in that time frame anyways, it just feels like the sort of thing I’d be better off doing after my current pool pump bites the dust. LED Lights: I did replace about 25 or so incandescent light bulbs with LED ones I got at Costco. According to the math I did, that should have an ROI in about 12-18 months. I was pretty impressed with this. All of the LEDs work great, and I am actually quite impressed. So far, I haven’t gotten an electric bill to compare, though. HVAC System Sealing: Based on a $59/year HVAC system efficiency improvement to do the duct sealing, I think that’s not really useful either. That actually has a 20+ year ROI, so not really even worth thinking about. Window Screens: The windows… will probably do that once summer hits. Send me photos whenever you get some and I’ll show them to my wife. At $37/year it has a ROI after 5 years so it’s not that much of an efficiency boost. But, I do plan to move my office into that back room. So, it’s also a comfort thing… so that seems wise. New HVAC: Yeah, thinking about this. Right now, I’m thinking about just doing it in the first quarter of 2015. No major reason in particular, but my wife is due for a baby in the next 2 weeks so I wasn’t really rushing. I’m going to get 1 other quote on this. The $1,000 for the roof repair is what throws me off. It feels like I could get a roof guy out here for much less, so it made me wonder. I think that number is a guess on your part… the estimate says “Need pricing for foam repair” and since it’s a cool $1,000 it seems like it’s a guess. I thought the updated APS report was useful. I think the overall audit was a real learning experience for me and it helped me realize my home is pretty energy conservative. It’s something I’d recommend to other people, but I also slightly realize that it is the big energy devices that end up really using lots of electricity.